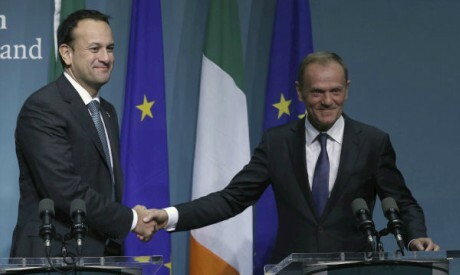 "Let me say very clearly: if the U.K.'s offer is unacceptable for Ireland, it will also be unacceptable for the EU," Tusk said. "The key to the U.K.'s future lies — in some ways — in Dublin," he added. After Britain leaves the bloc, the currently invisible 310-mile (500-kilometer) frontier will be the U.K.'s only land border with an EU country. Britain says it wants to maintain a "frictionless" flow of people and goods with no border posts. But Ireland is demanding to know how that will work if Britain is outside the EU's borderless single market and tariff-free customs union. "We don't have long, but I believe with the right engagement and the right political will we can reach an agreement on the way ahead," he said. Any hurdles to the movement of people or goods could have serious implications for the economies on both sides, and for Northern Ireland's peace process. The military checkpoints and customs posts imposed during Northern Ireland's "Troubles" have vanished since a peace accord was signed in 1998, and trade across the border has thrived. Thousands of people live on one side and work on the other, or cross daily to shop or socialize. The U.K. Parliament's Brexit committee warned Friday that despite government promises, it may be impossible to avoid border checks after Brexit.